Pitch Fork, Octaver/Harmonizer/Whammy from Electro-Harmonix. The Pitch Fork comes with its own 9V power supply. It can also be powered with a 9V battery, which unfortunately can’t be accessed without unscrewing all four screws on the back panel. I assume most people will use the adapter anyway, so it isn’t that big a deal, but it would really be a drag if you had to replace a battery during a gig. Pitch Fork’s I/O is straightforward and includes a 1/4” input, a 1/4” output, 1/4” expression pedal input, and the power supply input port. Control wise the pedal features two knobs, two switches and a button. I’ll deal with the knobs first. The Blend knob controls the wet/dry mix, letting you control the balance between shifted and original signal. If you turn it full up, you’ll get only shifted signal, and you'll then notice a little latency, which isn't noticeable when the original signal is in the mix. The Shift knob lets you choose between 11 different pitch shift options: Detune, minor second, major second, major third, perfect fourth, perfect fifth, major sixth, minor seventh, 1-octave, 2-octave, and 3-octave. Here's an example of the Detune effect. The Mode Toggle Switch is a small three-way switch that lets you set the Pitch Fork to shift up when it's pointing up, or down when it's pointing down, at whatever the selected interval is. The middle position is called Dual, and it gives you a variety of three-part harmonies, depending on the setting of the Shift knob. Most consist of your original note plus two harmonized notes, but some featuring a harmonized note up and an octave of the input note down. For instance, when you set the pitch knob to a major third with the Dual mode engaged, you get your original note, a major third up, and a fifth up, giving you a major triad from a single note. In this example, I’m using that setting, and just playing single notes, but they’re getting turned into chords by Pitch Fork. Another example of a Dual Mode setting is when you select Perfect fourth on the Shift knob. Pitch Fork also adds a Perfect fifth down, giving you a sus4 chord on every note. At the bottom of the pedal, next to the on/off status LED is the Bypass Footswitch, a standard guitar pedal on/off switch. Its behavior is dictated by the Latch button, which sits above it. With the button in the down position, the pedal is in Latch Mode, in which the Bypass Footswitch acts in a standard fashion, turning the effect on or off with each press. In case you're wondering, the bypass is buffered. With the Latch button in the up position, Pitch Fork is in Momentary Mode, in which the pedal is only active when you’re holding down the Bypass Footswitch and goes off when you release it. It lets you turn on and off the pitch shifting without having to click the switch on and off, making it easy to switch between shifted and non-shifted notes very quickly and seamlessly. . In this example, I’m in Momentary Mode and am only activating the pedal on selected lines. If you have (or separately purchase) a compatible expression pedal, such as a Roland EV-5, a Boss FV-500L, a Moog EP-2 or EP-3, or an M-Audio or EHX, and connect it to the Exp Pedal input, you can get some cool additional functionality from the Pitch Fork. 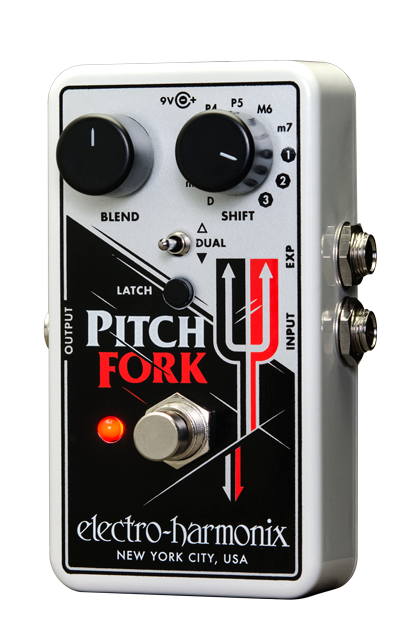 When the Pitch Fork is in Latch Mode, the expression pedal smoothly shifts the pitch between from no shift up to full shift (based on the shift setting). Although it’s difficult to accurately bend to a lesser interval than what the pedal is set to, it can be done. For instance, with the Shift knob set on Perfect Fourth, you could press the pedal most of the way down to get a major or minor third or any other interval in between. You can also shift up into a note by engaging the pedal while the note you played is sustaining creating some cool sounding bends that are almost pedal steel like. Check out the bends in this example. If you're looking for whammy-pedal type effects, you can approximate them by moving the pedal rapidly up and down, especially with the shift set to an octave or two up. When the pedal is in Momentary mode, and the Bypass Footswitch pressed down and held, the position of the pedal dictates how long it takes the note to get from un-shifted to fully shifted, and vice versa. Electro-Harmonix refers to the speed of the change as the Glissando Rate. It ranges from an undetectable 4ms with the heel of the pedal down to a tantalizingly slow 2 seconds with the toe down. I’m not sure what the musical usage of having a 2 second Glissando Rate would be, but you can make cool police siren effects with it You can even set the pedal to save a specific Glissando Rate. According to the manual, the default Glissando Rate — with no pedal attached — is a quick-but-audible 60ms. I was quite impressed with Pitch Fork’s sound quality. It’s not noisy or glitchy like some pitch shifters — in fact, it’s very clean. Check this example out. I played a bass line on my guitar, and with the pedal set to shift down an octave and the Blend set to 100 percent, I got a credible pick bass sound that wasn’t nasty or ring modulated like you hear on many octave dividers. 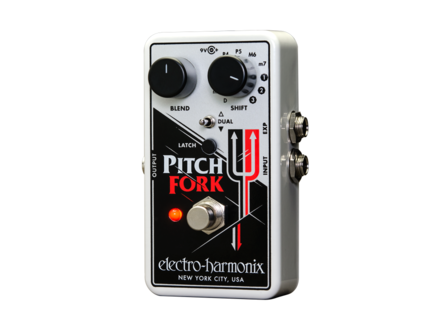 The Pitch Fork ($158.20) is another creatively designed pedal from Electro Harmonix. Its Momentary and Latch Modes give you different performance options, and the Mode Toggle switch allows for either up or down shifts or the various three-part harmonies available in Dual mode. I only have two complaints. One is relatively minor: The necessity to unscrew four screws to change the battery. The other is a little more substantive: You can’t access all of the pedals functionality without buying a third-party expression pedal, which, depending on brand, can cost you between about $30 and $80. Overall, though, the Pitch Fork provides a good combination of sound quality and utility, and if you’re looking to add pitch shifting to your pedal board, it has a lot to offer. With a expression pedal connected, you can do smooth shifts from root note to fully shifted, and even in between.